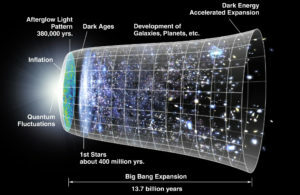 The age of the universe can be estimated through several methods such as, cosmological models, age of the chemical elements, the oldest star clusters, and the oldest white dwarf stars. The measurements of chemical elements, star clusters and white dwarf stars yield a mean age of the universe of 12.94 billion years +/- 0.75 billion years. This figure is consistent with the cosmological models that place the age of the universe at 13.7 billion years +/- 0.2 billion years. 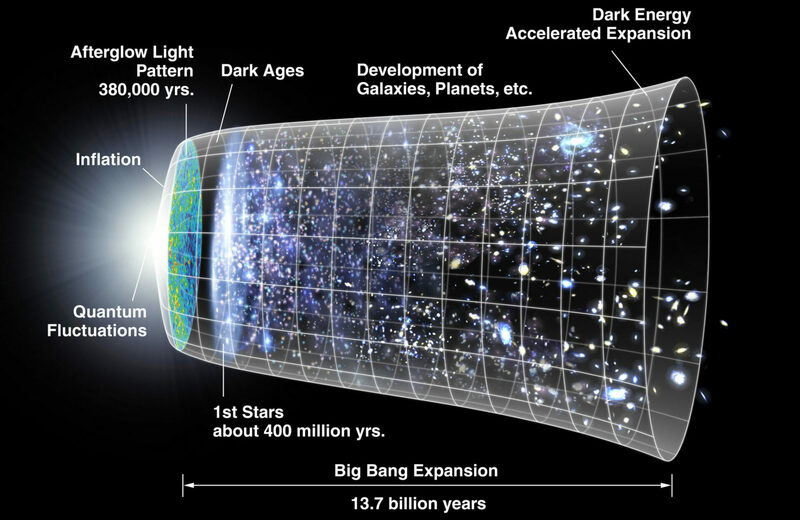 The observable age and location of the universe of stars as determined by various methods is consistent with the Big Bang model. As areas of matter coalesced over the first 200 million years, gravity wells began to become dense enough for fusion to occur. This resulted in formation of the first stars and galaxies. Life as we know was made possible through the various cycles of star formation and decay, subsequently resulting in the elements found in the universe today. The sun and the surrounding solar system formed approximately 4.57 billion years ago as can be demonstrated by various computer models, radiometric data, and cosmochronology. Cosmochronology is a newer form of radiometric dating that typically relies on uranium and thorium decay. Based on stellar mass and an understanding of hydrogen the Sun has an estimated lifespan of approximately 10 billion years. This places the Sun near the middle of it’s active lifespan currently. Direct measurements of the age of the Earth are not possible through rocks found on the surface to date due to substantial recycling of the Earth’s surface through the process of plate tectonics. However, through measurement and comparison of materials found on Earth dating to as far back as 4.4 billion years, as well as radiometric dating of uranium isotopes that can be compared to other bodies in the solar system, the age of the Earth can be reasonably estimated to be 4.54 billion years old. The currently held hypothesis for the formation of the moon relies on a major impact between the early Earth and an approximately Mars sized body that formed in orbit with Earth. This secondary body has been given the name Theia after the Greek Titan of the same name that was (fittingly) said to have given birth to the Moon. The impact of Theia with Earth is believed to have ejected a significant portion of Earth’s silicate mantle as well as Theia’s mantle and likely a portion of it’s own core to later form the Moon some 10 million years after the initial formation of the Earth. This method of formation is often referred to as the Giant Impact hypothesis. “We often hear the question how evolution explains the origins of life. The short answer: it doesn’t.” The origins of life lie in the subject of abiognesis. Abiogenesis may have begun as early as 120 million years after the formation of the Earth and Moon. While there are very many methods under consideration in the field of abiogenesis, what is generally agreed upon is that the chemicals and processes necessary to begin were available on Earth as early as 4.4 billion years ago. While fossil evidence is at best extremely difficult and somewhat ambiguous, fossil evidence of some nearly first life is believed to exist in the form of early ancestors of modern stromatolites. A period of global glaciation in which ice can be convincingly demonstrated to have covered the earth from pole to pole. While three such events are believed to have occurred, the last and greatest is believed to have occurred 650 million years ago. Early events are thought to have occurred 710 million and 2.2 billion years ago. There were at least four major extinctions during the Cambrian period resulting in the mass extinction of most of the sponges, shelled creatures, and other invertebrates that had evolved by this time. A period of cooling and glaciation is the currently held belief as to the Cambrian extinctions. This extinction event is considered to be the most far reaching and devastating extinction event in the history of life on Earth. The cause of this extinction is not truly known, but glaciation and volcanic activity are the most widely accepted. It is estimated that ,ore than 98% of all life on Earth fell extinct during this time. While it may not have been the big one, this is the probably the most well known extinction event in the public mind. The K-T extinction is the event that killed the dinosaurs and made way for the rise of mammals. The general consensus is that a major impact from a meteor caused this extinction. The last common ancestor of orangutans, and the African apes (including chimpanzees and bonobos, humans, and gorillas) is believed to have lived some 12 to 14 million years ago. The current contender for this role is pierolapithecus, this species lived in the proper time frame proposed by geneticists, and holds all the necessary physical traits. Early hominids are believed by geneticists to have developed bipedal locomotion approximately 6.5 million years ago. The earliest hominid known to possess this method of upright walking is currently that of ardipithecus ramidus dating to 4.4 million years ago. The Stone Age is named after the predominant form of tool usage of the time and stretches to the time of Neanderthal and Early Modern Humans. There have been discoveries of cave paintings from the later portions and stone tools from throughout this period. Neanderthal is a divergent species of hominid believed to be less adaptable and less capable of communication than Early Modern Humans. This lack of communication and adaptation is considered by many to be the downfall of this species. Early modern humans while possibly a bit more physically robust than us are often concerned in many other ways indistinguishable from modern humans. Neanderthals are believed to have simply lost the competition with Early Modern humans. Young Earth Creationists place Earth’s creation at 6,000 to 10,000 years ago. Humans entered the Bronze Age as metal smiths began to create various alloys of copper, specifically Bronze. The Iron Age is generally broken into two parts, the first overlapping the late Bronze Age. This age heralded some of the earliest advancement in society. Created to better attune the Julian calendar to the true cycle of the Earth around the Sun, and the Moon around the Earth. Also, to better schedule Christian holy days with the lunar cycle. Accurate to approximately 1 day in 3300 years. Eschatology: Armageddon / Revelations / Rapture / etc. 2000 / 2012 / In our lifetime / Soon / etc. As the normal process of the expansion of the Sun, the Earth will eventually rise in temperature until the atmosphere and surface water have boiled into space, thus ending life on Earth. Hold on for a bumpy ride, the Milky Way and Andromeda galaxies are on a collision course. Due to the vast spaces between stars, it is quite likely that a majority of stars will survive intact, as the individual stars pass harmlessly through interstellar space during the collision. While there is an astronomically small chance the Sun will be wiped out in the merging of the Andromeda and Milky Way galaxies, it is extremely unlikely. However that doesn’t mean the Sun will escape death. The Sun will have used up enough of it’s hydrogen resources about 5.5 billion years from now. This will send the Sun into it’s red giant phase. The long dead Earth is expected to yield to the tidal forces of the sun and be engulfed by the Sun during this time. Upon expending most of the remaining hydrogen fuel the Sun will become a white dwarf. As the end of the universe nears, production of stars will fail. Existing stars will burn up the last of their fuel supplies and the breakdown of stars into their constituent parts will begin. The last of the black holes created as larger solar mass stars came to an end will fade, slowly leaching out the last of their absorbed energy. Just as a the heat in an undisturbed room will eventually equalize, so too will the heat of the Universe equalize until a uniformly cold dead Universe is all that remains.